William Burke’s new play, Comfort Dogs: Live from the Pink House, comfortably exists somewhere between a scruffy theater event, a live music concert, and a dog park. 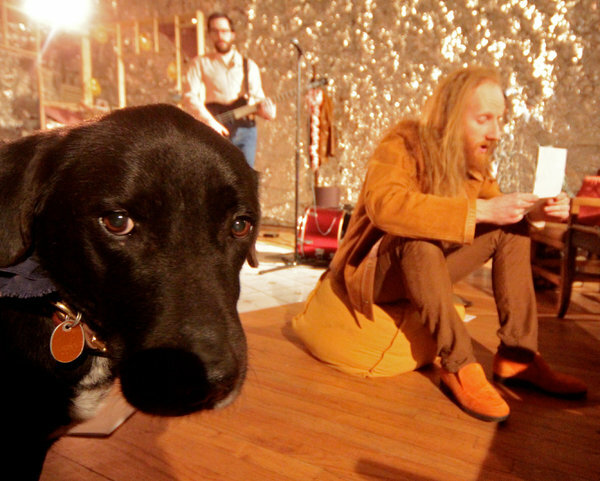 While the five human performers hoist guitars and basses, sing into microphones, retrieve and recite the contents of sealed letters that have been distributed to random audience members, and lap bourbon out of a bowl, the three canine participants have an easier go of it; they’re simply existing in the space, howling along with the music when the spirit moves them, dozing next to an audience member on one of the couches, sniffing the other audience members, and occasionally trotting nervously into the playing space, looking around pensively, and then returning to find solace in whichever audience member is kind enough to reach out and pet them (most seem compelled to do so). The dogs – who appear untrained in the ways of the theater and are not, as show dogs tend to do, performing for a treat – exhibit the ability to upstage any activity that might be taking place onstage whenever they decide to run across it. While this might seem potentially distracting, the cumulative effect is actually more of a focused tension between the human activity and the dog activity. The audience is held and captivated throughout the performance in part by the fact that dogs can clearly take over this show, just by barking or howling or fighting through the entire thing – the fact that they don’t, at least not at the performance I watched, creates a palpable interest in tracking them, trying to figure out if they’re watching or not, what they’ll do next. The dogs function as a chaotic variable that allows the play as a whole to basically maintain itself as an environment without suffering from the stasis that often accompanies plays that do not heavily rely on recognizable plot or narrative momentum. Perhaps at this stage one might be wondering how the human participants fare within this environment? Surprisingly well, given that we as an audience are perhaps less inclined to grant humans as much of our rapt attention as we happily (automatically, almost) bestow upon the dogs. One key performative element and probably the most notable directorial decision made by Mr. Burke is that the performers act, by means of a sort of impersonation, like dogs. Specifically, these dogs. (Their names are Bluet, Bronco, and Gypsy.) It’s a specifically neurotic, apologetic, and bewildered attitude, complete with the hesitant approach, the half-retreat, and then the 180 degree return; it’s the text that they’re after. Pre-show, a number of envelopes have been placed among the audience, and the human (but dog-like) performers must retrieve them as though the envelopes were off-limits dinner table treats. Once opened, they contain handwritten notes that the performer then reads aloud, giving voice to semi-abstract melancholic hopes, dreams, and pleas for attention. The use of language within the letters suggests something is slightly off; is this an articulation of how a dog might write? The text feels in tune with the performance of the humans – uncertain, halting, non-ironic, a little mysterious. The key to the success of the performance as a whole lies in this stylized approach; I suspect that if the piece were merely five likable actors playing their instruments and reading the occasional piece of text with the dogs running about, it would feel more like a backyard gathering with spoken word mixed in. This is to say, the dogs wouldn’t feel integrated or necessary. Because of the specificity and authenticity of the human performances, we are instead left with many wonderings: Are we all dogs? Are we a human audience watching a performance by dogs? How do we read into the sense of overwhelming melancholy that slowly emerges and asserts itself via the tone of music and text both? Do we get to howl along? Is that okay? Yes, let us howl. Comfort Dogs: Live from the Pink House is running at Jack through March 14th. For tickets and show times, visit www.jackny.org.